Lt Col. Tommy Hayes leading the 357th FG in action over Paris. 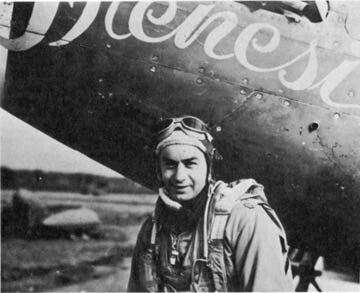 On July 25th 1944, 54 P-51 Mustangs of the 357th Fighter Group took off from their base at Leiston, England with Lt Col. Tommy Hayes leading them in his P-51D which he named "Frenesi" after a popular song of the day. Their mission was a fighter sweep over France in conjunction with "Operation Cobra" which was the code name for the carpet bombing of German positions in the vicinity of St. Lo -Perriers to aid in the US 1st Army's breakout from Normandy. Despite precautions by 8th & 9th Air Force heavy and medium bombers and ground controllers to insure that American positions were not bombed, 102 US troops were killed and 380 wounded by bombs which fell short of their intended targets. We ran head-on into about 20 enemy aircraft at 20,000 ft. on our route out. As soon as they saw us, they broke off and headed for the deck. They were about five miles west of Paris and headed for town for protection. I singled out an FW 190 and came within shooting range at 4,000 ft. in the vicinity of the Eiffel Tower. I fired several long bursts from 300 yards, doing 400 mph and seeing many strikes on the fuselage. The ship started to smoke and pieces flew off at every burst. He got down to 2,000 ft. and he was burning and smoking so badly and the flak was so intense that I pulled away. I was going about 150 I.A.S. in a 30 degree glide when I broke away and am certain that his engine was dead. I claim one FW 190 destroyed. Flying on Carson's wing that day was Raymond "Ted" Conlin who continues the story in a quote from the 357th over Europe by Merle Olmstead "...We were now at 300 Ft. and Kit was getting hits all over the Focke Wulf when its engine failed. We were headed east just above the Grand Armee - Champs Elysees Boulevard. It looked like the the 190 was going to crash into the Arc de Triomphe and the pilot must have been dead because he did not try to jump. "Carson broke away and I was fascinated watching the prop wind-milling as the 190 headed for its demise. All of a sudden I realized Carson was gone and I was at 300 ft. and every soldier with a weapon was firing at me. (I even saw one officer whip out a pistol and shoot at us.) The Germans had AA weapons on the roofs and in the parks and they were all concentrating on me. I saw the Sein River off to my right and swung down into it. Hugging the north bank which is about 50 ft. high. The guns could not depress enough to reach me that way." Three of the five pilots who scored victories over Paris on July 25th were Captain Don Bochkay brought his tally to 8.83 of his total of 13.83 victories, Captain Leonard Kit Carson (as noted above) and Captain Robert Foy scored his 7th. Foy finished the war with 15 air and 3 ground victories. 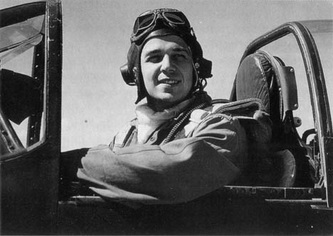 He was killed in a B-25 explosion in 1950. 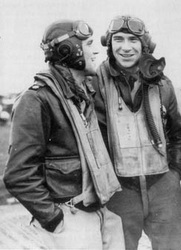 Carson's squadron mate John Pugh made ace that day. He latched on to an Me 109 and started turning with him. 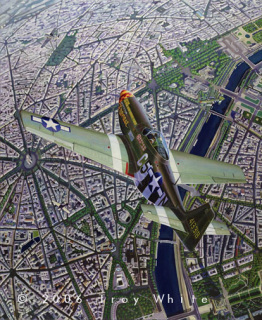 "...At about 300 ft. above Paris, I closed from 200 Ft. to about 50 Ft., firing all the time. My speed was about 250 M.P.H. I saw strikes on the canopy. Then the pilot bailed out in a grey or brown parachute..."
Captain Don Bochkay of the 363rd FS shot down one Me 109 (...His canopy blew off along with large pieces, he was smoking badly, he then rolled over on his back at about 3,000 ft. and I saw him crash in the city of Paris...). Bochkay also damaged another 109 before his guns failed to fire. Pugh's and Bochkay's victories were probably over Me 109s flown by III./JG 26 who lost two aircraft flown by Ofhr Leinberger and Uffz Salewsky who parachuted safely. Captain Robert Foy got an Fw 190 "...Smoke started pouring out of the right side of the E/A and he continued turning to the left. I pulled up to avoid collision with a silver P-51 and then continued on the E/A tail. He was still turning at about 100 ft. from ground -- he hit the ground in the middle of a small racetrack and I flew directly over the top of him at about 100 ft..."
Additionally Captain Robert Becker claimed an FW 190 destroyed without even firing his guns. He dove after the 190 and caused the German pilot to fly through a wall of anti-aircraft fire in an attempt to evade Becker. "... I was about 800 yards and closing on the enemy when he went straight into the ground and exploded in the NE section of Paris..." Becker was not awarded a victory for this engagement. The "Yoxford Boys" all made it home that day. Lt. Col. Hayes remained with the group for another two weeks or so before his tour was up. He stayed in the Air Force and retired as a Brigadier General in 1970. 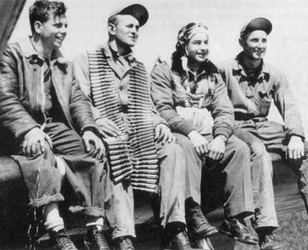 When all of the scores were tallied up after VE-Day the "Yoxford Boys" had racked up the highest kill ratio of the entire 8th Air Force. In just 14.5 months of operations the 357th FG scored an impressive 591 aerial and 106 ground victories. They produced 42 Ace pilots with 5 or more aerial victories and had more victories against German jets (18.5) than any other unit. 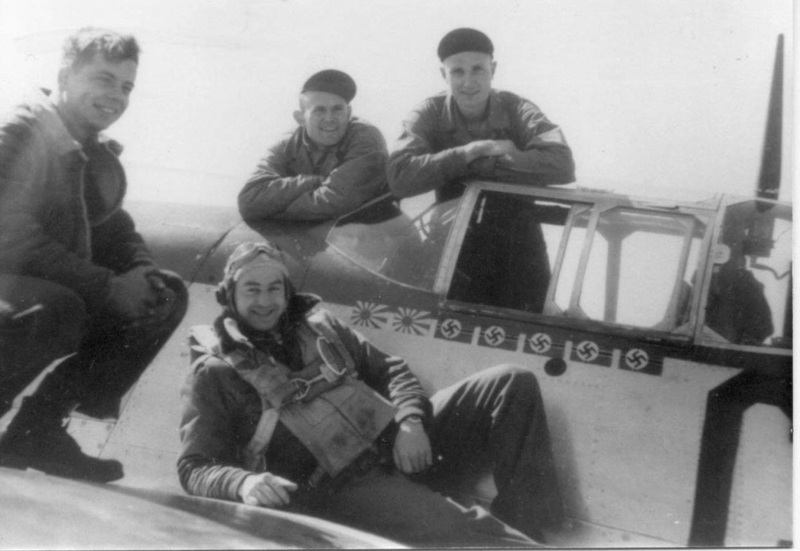 To top it off they received a Distinguished Unit Citation for shooting down more enemy aircraft in a single mission than any other unit when they dispatched 54 German interceptors on January 14, 1945.